It was not clear who would replace Hailemariam, who resigned as chairman of the ruling coalition that contains four parties representing Ethiopia's ethnic groups and has governed the country. In March 2018 Abiy Ahmad became the chairperson while Demeke Mekonnen retained his position as the vice chairperson. Many people had suggested that Deputy Prime Minister Demeke Mekonnen, who also served as president of the Amhara National Democratic Movement (ANDM), could be considered for the position. But by July 2017, Demeke Mekonnen, deputy prime minister and vice president of the ruling Ethiopian People's Revolutionary Democratic Front (EPRDF), had become increasingly isolated. Deputy Prime Minister Demeke Mekonnen was the highest-ranking Amhara in the ruling coalition as of early 2018. Amharas hail from the northern and central highlands. The deputy prime minister was widely expected to succeed Hailemariam. Another option was that the four core parties of the ruling coalition will elect a new party leader who then will lead the country. Demeke Mekonnen Hassen was born in Wello Region, and later was resettled to Chagni Woreda of Agew-Awi Zone in Amhara Regional State when the Derg Regime relocated people to resettle in other areas. He joined the Addis Ababa University and studied Biology in the Arat Kilo campus and received his BA in 1988. Demeke Mekonnen Hassen was born in Wello Region, and later went to Chagni Woreda of Agew-Awi Zone in Amhara Regional State when the Derg Regime relocated people to resettle in other areas. He joined the Addis Ababa University and studied Biology at the Arat Kilo campus and received his BA degree in 1988. After graduation, he returned to his native region to begin his career in teaching. Demeke was sent to a high school in Feres Bet, a small town located in Dega Damot Woreda in West Gojam Zone, off the main road from Addis Ababa to Bahir Dar. He taught biology in Feres Bet High School, for two years, before he was transferred to Bure town in the same regional state. In Bure, while teaching at the only high school in the area named after former governor of the region, Ras Bitweded Mengesha Atikim, Demeke met Alemitu Kassaye, a student of the high school at that time, and later his wife and mother of his three children. 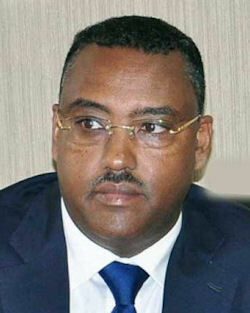 Demeke joined the ruling EPRDF in the early 1990s. Demeke first took part in the national election held in 1995, and won a seat in the Amhara Regional Council, where he was appointed general secretary. In the middle of his term, he went to England to do his post graduate studies in conflict management. Upon his return, he was assigned to establish and lead the ethics and anti-corruption commission of the region. He was then moved to head the administrative and security affairs bureau of the region, where he had served up until 2005. He was then promoted to the vice presidency of the regional state following the highly contested election in 2005, under the presidency of Ayalew Gobeze. A year later, he was elected to the executive committee of ANDM, a member of the EPRDF coalition formed in 1983, in Jerba Yohannes of Wag Himra Zone. Finally, he was elevated to the position of deputy chair of the party replacing Tefera Walwa; and in 2010 became the first non-combatant chairman of the ANDM, replacing Addisu Legesse. He served as Commissioner of Amhara Region Ethics & Anti-Corruption Commission; Head of Amhara Region Administrative & Security Affairs Bureau and Amhara Region Cabinet member; Vice President and Head of Capacity Building Bureau of Amhara Region (2005–2008); and Member of House of People’s Representatives from 2010. On 30 October 2008, the Ethiopian parliament approved the appointment of nine ministers presented by Prime Minister Meles. Five of the nine ministers were members of the former cabinet and four are newcomers. Demeke Mekonnen became Minister of Education. A Central Committee member of the Amhara National Democratic Movement (ANDM) party within the Ethiopian People's Revolutionary Democratic Front (EPRDF) coalition, Demeke served as Secretary of the Amhara Region under Addisu Legesse from 1995 until October 2001. After 2001, he ran the Ethics and Anti-Corruption Bureau in the Amhara region until his appointment as Vice-President of the Amhara Region in October 2005. Hailemariam Desalegn was sworn in as prime minister of Ethiopia 21 September 20122, marking Ethiopia’s first peaceful political transition in modern history. Hailemariam had been acting prime minister since the death of Meles Zenawi in August 2012. Minister of Education Demeke Mekonen was sworn in as deputy prime minister. Hailemariam had served as minister of foreign affairs and deputy prime minister since 2010. It is significant that neither Hailemariam nor Demeke was a member of the TPLF (Tigray People’s Liberation Front), which led Ethiopia since the 1991 overthrow of the Mengistu communist regime, nor were they members of the Orthodox Church, unlike all of their predecessors. In late 2015, the failed spring and summer rains compounded with the arrival of El Nino in November 2015 left 8.2 million Ethiopians in need of international assistance. In August, well, the number of people that were in need was put at about 4.5 million and then recently, in mid-October, the government revised that estimate up to 8.2 million. The Deputy Prime Minister, Demeke Mekonnen, was put in charge of organizing both the government response and the response with the donors. Ethiopia’s Prime Minister Hailemariam Desalegn announced a Cabinet reshuffle November 01, 2016, following months of often-violent protests which led the government to declare a state of emergency. Ethiopia’s parliament unanimously approved 21 new appointees, the prime minister said Tuesday. He said the new ministers were picked for competence and commitment rather than “party loyalty." Nine officials kept their previous posts in the Cabinet reshuffle, including Defense Minister Siraj Fegessa and the prime minister's deputy, Demeke Mekonnen. Amhara National Democratic Movement (ANDM) reaffirms commitment to cultivate good governance and realize the deep renewal objectives, Deputy Premier ANDM Chairperson Demeke Mekonnen said 18 November 2017. Briefing journalists, in connection with upcoming commemoration of ANDM's 37th anniversary Demeke reiterated that while marking the day renewing commitment on sustaining the present peace and stability is the main agenda to be undertaken. “Promising results has been seen on democratization and ensuring good governance following the deep renewal.” Demeke added.